(1941) Leslie Banks, Alastair Sim, John Mills, Carla Lehmann, Jeanne De Casalis. Inside a wartime cottage in Scotland is a no-nonsense scientist who is developing a new bombsight for the British military. The Nazis, however, have hatched a plot to steal the device. 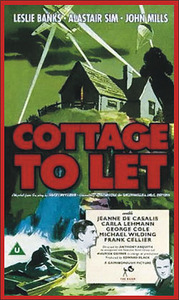 The cottage is soon visited by a downed RAF pilot, and a London evacuee, as well as a parade of other colorful characters, any of whom could be a Nazi spy. Well-made and fast moving, this British intrigue film is a minor gem. It also has a good bit of British humor. De Casalis will make you laugh more than once. An excellent “little” film. From 16mm.